Does a heart attack always cause severe chest pain? What should I do if I have the symptoms of a heart attack? If I'm not sure I am having an attack, should I call my local emergency telephone number? What medical treatment can I expect? A heart attack (or myocardial infarction) occurs when a coronary artery, one of the blood vessels that supply oxygen-rich blood to the heart muscle, becomes blocked. The area of heart muscle that does not receive blood begins to die. The seriousness of a heart attack depends on how much of the heart is affected. Often the surrounding healthy muscle keeps working, allowing the heart to keep pumping while the injured muscle heals and recovers some of its strength. The signs of a heart attack can be subtle and hard to identify. Many people don't recognize the symptoms even when they are in the middle of a major heart attack. The amount of time that passes before you receive treatment can mean the difference between life and death. Learn about the symptoms of heart disease and your own risk factors. Get help immediately even if you are not sure you are having a heart attack. A heart attack feels different to different people. Even if you have already had a heart attack, a second one may not feel the same. 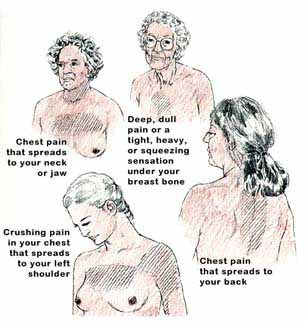 You may feel pain in any of the areas of the body shown below. Or you may feel pain only in your arms, jaw, or back. Other warning signs of a heart attack include dizziness, fainting, sweating, nausea, or weakness. Angina--a feeling of pain, heaviness, tightness, burning, or squeezing in your chest--is an indication that you have heart disease and are at risk of having a heart attack. Angina occurs when the heart muscle does not receive enough oxygen because of a temporary narrowing of one of the coronary arteries that supply it with oxygen-rich blood. Angina usually occurs during physical exertion or emotional stress. Tell your doctor immediately if you have any symptoms of angina, which are similar to those of an actual heart attack. Prompt treatment for angina can prevent you from having a heart attack. Many people experience angina for years, but do not seek treatment and eventually have a heart attack. Sit down or lie down. If symptoms persist for 2 minutes, call your local emergency telephone number and say you may be having a heart attack. Leave the phone off the hook so that medical personnel can locate your address if you should become unconscious. If you have nitroglycerin tablets, take up to three pills, one at a time every 5 minutes. Ambulances are well equipped to provide emergency care for people who are having heart attacks. It is usually better to have medical personnel come to you than for you to start off for the hospital. If you can get to the hospital faster by car than by ambulance, have someone drive you. Do not drive yourself--it could be dangerous. Do not delay getting medical treatment, even if you are not sure you are having a heart attack. A delay can cause permanent damage to your heart muscle or even death. Let the doctor determine whether or not you are having a heart attack. If your breathing or pulse stops, any person who is trained in cardiopulmonary resuscitation (CPR) should immediately begin the procedure. Call your local emergency telephone number first. When you arrive at the emergency room, you or the person who brought you should announce clearly that you may be having a heart attack. Make sure you are seen at once. Nitroglycerin is a drug that reduces the pain of angina by widening blood vessels to allow more blood to reach the heart muscle. You place nitroglycerin tablets under your tongue whenever you feel the pain of angina or anticipate it coming on. People who have angina should have nitroglycerin with them at all times and should take it immediately if they feel pain in their chest. If I think I might be having a heart attack, but I'm not sure, should I call my local emergency telephone number? Reason for delay: You think that only men have heart attacks. Reality: Heart disease is the most common cause of death in women as well as men. If you have symptoms, call for help. Reason for delay: You are not sure it is a heart attack. Reality: Call anyway--heart attack symptoms can be vague. Reason for delay: It feels like heartburn. Reality: If you have a history of heart disease, angina, or high blood pressure, the heartburn you feel may actually be a heart attack. Call for help immediately. Reason for delay: You'd feel embarrassed if it turned out you didn't need medical help after all. Reality: Never feel embarrassed about calling for help. A little embarrassment might save your life. Reason for delay: You're hoping that it is not a heart attack. Reality: Wishful thinking can be deadly. You can't wish a heart attack away, and getting treatment quickly can save your life. Most people who survive a heart attack can return to their normal life, including work, within 3 months. What medical treatment can I expect if I have to go to the hospital for a heart attack? Much can be done to help you recover from a heart attack, but you must take the first and most important step--getting medical help immediately. At the hospital, the emergency room staff will determine if you have had a heart attack by doing a test called an electrocardiogram (ECG) and by taking a blood sample to test for chemicals that are secreted by damaged heart muscle. You may be given drugs immediately to help dissolve a clot that may be causing the blockage. If your heartbeat is abnormal, the doctor may need to restore a normal rhythm with a defibrillator, which delivers an electric current to your heart. If your heart has stopped, doctors will compress your chest rhythmically to try to maintain normal pumping action until your heartbeat has been reestablished. Later, you may be given blood-thinning medications to help prevent a clot from forming again or to prevent new clots from forming. Your care will continue in the coronary care unit until you are out of danger.